Hey guys it's your boy Boba Fett here ready to collect another bounty with ya'll! Fett gives the Imperials quite a bit of tricks. Let's look at what he brings to the party. At 140 points, Boba Fett is quite a decent chuck of your list for a single model. For the Imperials, only Vader and the AT-STs are currently more pricey for a single unit. So what does he bring to the table that those two units don't? The most obvious answer is his maneuverability - Speed 3 plus a Jump 2 action keyword gives him the ability to cover a large portion of the map and ignore a lot of terrain, and while he can't quite go Speederbike or Airspeeder distances without a compulsory move, he CAN move in any direction he wants, or stay still, being a simple trooper. Health wise his value of 5 isn't spectacular and while he does have a surge to block and Red defense dice (4/6 chance to block) he is in danger of being aced by a set of bad rolls. Impervious helps him avoid being instantly gibbed by any Lightsaber wielders or named characters, but contrary to with the name implies, it isn't strict immunity to all Pierce attacks. He merely adds defense die. This means a 44% chance of dodging an incoming Pierce hit instead of the usual 66% he typically gets (and this gets lower the more hits there are). Better than just eating the damage like a chump, but hardly Jedi levels of just ignoring Pierce. Interestingly enough, if your opponent has more Pierce than actual hits it actually gets worse for Boba Fett to block that specific hit, as odds of him rolling say 3 blocks on 3 dice to cancel one hit with Pierce 2 is only 30%. Related to defense, his courage value of 3 is very strong, making him an excellent candidate for Duck and Cover. Unfortunately he does not give this courage to nearby troopers, but you can certainly use him far from any of your commanders without worrying about him getting pinned down. For offense, Boba Fett first off has Sharpshooter 2 to straight up cancel whatever cover you want to hide behind. He also has some really great keywords to work with, surge to Critical, and Arsenal 2 to help get those things into play. Fett's E-3 Carbine is going to be his workhorse weapon, giving 2 Black dice at range 1-3 and Pierce 1. Useful and mathematically the best choice every situation. Just assume you'll be using this if not in melee. Fett's Wrist Rocket is 2 Black at range 1-2 with Impact 1, and will be your Carbine backup if he's not using one of his special weapon command cards. With that and your surge to crit you should average about 2 hits on Armor. Not game breaking, but nice flexibility. Fett's melee is Boot Spikes and is just 2 Red Dice, but with surges they are still 1.75 average hits. Not bad, but melee is not where you want him to be if at all possible. He also has several special weapon command cards we will cover later. Fett has room for 4 upgrade cards - 2 Training cards and 2 Equipment cards. Finally, he has the keyword Bounty. Bounty is going to get it's own section here, because you are going to want to maximize the potential from it. That means choosing your target and your objective carefully. 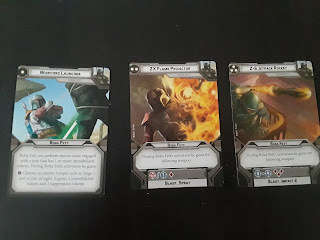 Breakthrough is probably the best single objective for a Boba Fett list, as he has the speed to make it into your opponent's setup area on a late turn, and it's likely to be a low scoring game anyway. Intercept the Transmission is usually a slog that ends near a tie, especially if no one can hold the middle on non-Battle Lines deployments. Recover the Supplies can give you a draw and a win on enemies destroyed if you fall behind on objectives, but most likely will wind up being a wash. And Sabatage the Moisture Vaporators is another objective that trends to a tie, that Boba's victory token can overcome. Target selection should be a unit that is easy to eliminate. Obviously if your opponent has only one eligible unit, you're not going to have much of a choice in the matter. But if they have 2 or more, you will want to focus on the easiest one to kill - which might not be who you think depending on your opponent. A Leia with Esteemed Leader surrounded by Fleet Troopers for example might not be as easy as Luke running off by himself into the middle of the fray. In fact, the very danger of Luke being worth a Victory Point by himself might be enough to force your opponent to avoid committing him, giving you the upper hand. This is a hard tactical consideration to give hard and fast rules to. It'll be up to you to figure out how best to use this in an actual game setting. This is really, really good for Fett, as his 3 Courage lets him take a suppression from Duck and Cover and then another from the actual shot, and still get 2 actions. I'm not saying this should be stapled to his card, but you're going to have to think long and hard before you don't include it. Especially because he has more important things to be thinking about than dodging. New card in with Fett. Attack a wounded unit, get a free Aim token. Good news is that it makes him easier to collect a Bounty with. Bad news is it doesn't work on generic troopers at the moment as they all have 1 health. Should work with Wookies / Royal Guard (some of the time) though! On a related note, special forces units and Han Solo can also equip this card. Some of them might get some benefit, like making your sniper Strike Teams more mobile, or giving more dice rerolls to your Scout Troopers while getting them all up in. Combines well with Hunter to give you some sweet dice rerolls. Definitely worth a look, especially with how many Black dice you have in your pool. Boba Fett has Jump 2. Not necessary. Uh, I just said Jump 2. This almost feels required for Boba Fett. For one thing, if he's killed on Turn 6 after he's already gone, you can use Emergency Stims to keep him around to collect his bounty. For another, you just want to get the most out of him and some unlucky rolls can end his day really, really fast. At least this way you can sneak in another round of blasting, or at least another round or two of tanking enemy fire. 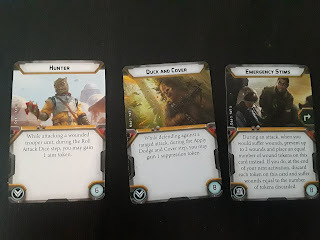 So the bad news is that Boba Fett as an Operative can't issue orders with anything but his own cards, and he can't issue orders to anyone but himself WITH his cards. The good news is that his cards are pretty sweet. Anti-Jedi tech. 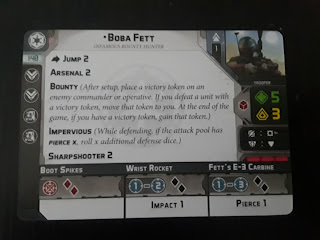 Boba Fett gets to hit a unit with a whipcord as a free action, giving it 2 suppression, 2 immobilize tokens, basically making it unable to move (unless it is a mirror Boba Fett). In addition, he gains the ability to move away from an enemy with immobilize tokens even if he's engaged with them. Best used on Vader / Luke, but he can pop it and run from pretty much any trooper threat getting close to him. He doesn't want to be tied down and in melee after all. Definitely worth taking. Boba gains a lovely weapon - Range melee / 1 with 1 Red Die... but Blast and Spray. Now Blast is kinda superfluous with Sharpshooter, but in case an opponent is immune to Sharpshooter some day, it gives him a bit of a backup. Makes him actually able to do some melee damage, but arguably better at Range 1 with his E-3 Carbine. Still not going to do much against a Jedi or named character (one model after all) but if he's cornered by a gang of cannon fodder, he'll make short work of them with Spray. Emergency Rocket Launcher with Blast and Impact 2. Again, kinda unnecessary with Sharpshooter. The sweet spot for it is Range 3, as you can add in the E-3 Carbine to it for Impact 2 and Pierce 1. Which should add up to about 3 hits to Armor on average, and probably all 3 as damage unless your opponent gets a really good roll. That being said, this comes on a 3 Pip card that only gives an order to Boba Fett. This may not be ideal for you, especially if you are counting on 3 Pip cards to smooth out your order pulls. Probably the one most likely to be left behind. That's it for Mr Fett. We'll be talking about Scout Troopers real soon! I don't understand how hunter doesn't work against standard troopers/ scouts. Isn't a unit with dead minis a wounded trooper unit? No, because that trooper mini is dead and has been removed from play. Thus it doesn't have a wound token.